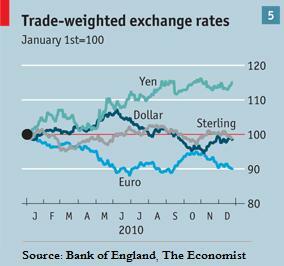 Based on every measure, the Japanese Yen was the world’s best performing major currency in 2010. It notched up gains every one of its 16 major counterparts, and was the only G4 currency to appreciate on a trade-weighted basis. Against the US Dollar, it rose 10%, and touched a 15-year high in the process. However, there is reason to believe that the Yen is now overvalued, and that 2011 will see it decline to more sustainable levels. I am still somewhat baffled as to why the Yen has risen so inexorably. It is said that “Hindsight is 20/20,” but in this case the benefit of hindsight doesn’t really provide any additional clarity. Of course, there was the Eurozone Sovereign debt crisis and the consequent shift of funds into safe-haven currencies, but let’s not forget that the fiscal problems of Japan are even more pronounced than in the EU. Premiums on credit default swaps signal that the probability of a Japanese government default is twice as high as it is for the US, and there are rumors of a downgrade in its sovereign credit rating. As one commentator summarized, “Just how the Japanese have got away with running up a debt to GDP ratio of over 200% (higher than the PIIGS and the U.S.) is beyond me.” Of course, it helps that this debt is financed almost entirely by domestic savings and is consequently not vulnerable to the changing whims of foreigners, but even so! Meanwhile, the opportunity cost of investing in Japan is high. While inflation is moot, equity returns are low and bond yields are even lower. “Japanese 10-year yields, the lowest among 32 bond markets tracked by Bloomberg data, will end 2011 at 1.24 percent from 1.19 percent today, according to a weighted forecast of economists surveyed by Bloomberg News.” Combined with low short-term rates, it would seem that the Japanese Yen would be the perfect candidate for a carry trade strategy. 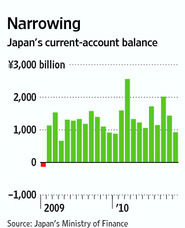 With GDP projected to fall to 1% in 2011, there would seem to be very little reason to continue buying the Yen. According to the most recent CFTC Commitment of Traders Report, speculators are building up massive short positions in the Yen. Meanwhile, the Central Bank of China is quietly paring down its Yen holdings. Even the Bank of Japan seems to have embraced this inevitability, as it is has already stopped intervening in forex markets on the Yen’s behalf. According to a Bloomberg News Survey, “Japan’s currency will tumble almost 10 percent against the dollar this year.” Very few analysts think that the bottom will complete fall out from under the Yen, but the majority (myself included) expect a correction of some kind. Nice work on the Yen fundamentals, Adam. I’m intraday all the way, and do as little with fundamentals (outside of news releases) as any profitable trader. That said, I appreciate your work with this post. I don’t know that the Yen is seen as anything more than a safe haven against the currency wars. With this past week’s news and the recent bout of “revisals,” plenty of intraday traders seem to expect further easing from both Europe and the U.S. And the Yen seems, to me, to be in a position only to receive strength until we see Europe and the U.S. act conservatively.